CLARK COUNTY, Ind. (WISH) — The black bear spotted in Indiana on July 18 has returned. The DNR posted on their Facebook page that the bear was spotted on the Clark and Scott county line. They posted a picture of the bear in a wooded area. 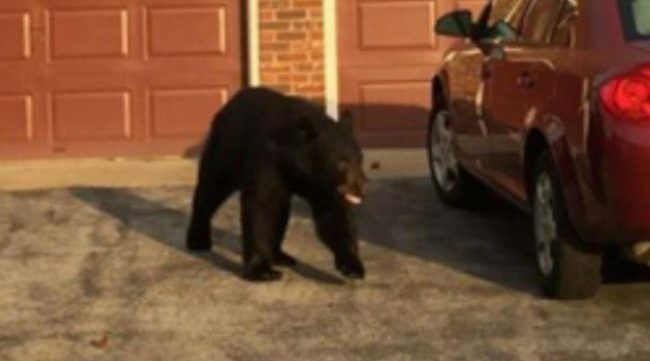 Previously, the bear was spotted in Corydon, Ind. The bear likely swam across the Ohio River from Kentucky, which has a growing population of the species, according to DNR. Conservation officers will monitor it to determine if the animal should be trapped and relocated or left alone. Bears in Indiana are extremely rare. One crossed from Michigan into Indiana in June 2015, becoming the first confirmed bear sighting in the Hoosier State since 1850. It was euthanized in April after wandering northern Indiana and southwest Michigan for months. DNR said it’s possible black bears will re-establish populations in southern Indiana. Read more. Indiana’s second bear in 140 years is proving to be quite a wanderer. The bear was first sighted on July 17 in rural Harrison County and is believed to have swam across the Ohio River near Louisville after being spotted several times in northern Kentucky. Eventually, it traveled to Corydon on July 18 where a bit of a circus atmosphere prevailed. Local and state officials monitored the animal, but didn’t interfere and it eventually left town headed north. Now confirmed sightings are coming in nearly every day. Since we covered the story in our last column, the bear has been seen near Sellersburg, Henryville and inside the Deam Lake State Recreation Area. The bear has since moved on to Crothersville and the area near the Clark-Scott county line. By the time this story is published, it is anyone’s guess where the well-traveled bear will be residing. Read more.